Fickle Feline: insanity: day 2.
day 2 and I'm a hot mess!! After wrapping P90X up, I knew I needed a different challenge. A lot of people jump right back into another round with Tony, but I wasn't quite ready for that (I'm waiting for the new P90X that is coming out later this year). 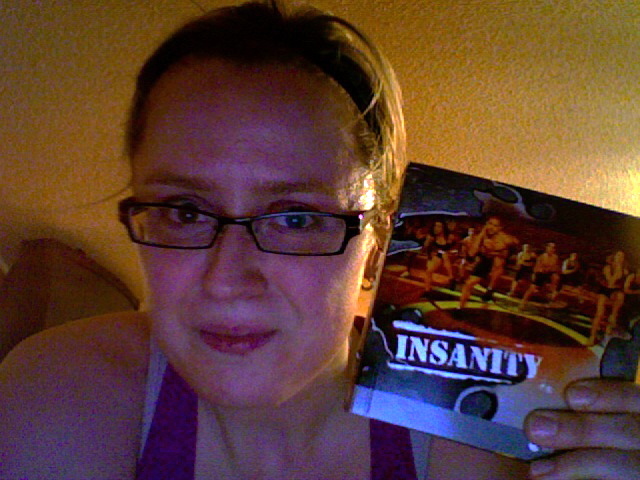 Somehow, my coach and online friend Gina talked me into joining her on the Insanity program. 60 days, 45 minutes per day tops, and the before and after photos from other people are incredible. I figured I'd give it a shot. My brother-in-law is getting married in June, so I set a goal of getting a new dress when I complete the program. Well. I thought I was in shape after completing P90X, but this program, it takes conditioning to a whole new level. On the first day you take a fit test to get a baseline of where you are at. I was huffing and puffing after only the warm up! Half way through the fit test I was cursing a blue streak. I am quite confident that Shaun T's name is taken in vain thousands of times a day around the world. And I bet you he loves that too. Day 2 is the real start of the program. Basically you go as hard as you can until you feel like you are going to fall on the floor, and then you do that again two more times before you get a 60 second water break. Then you work through a new series of moves in the same manner. It's 45 minutes of hell. But, to its credit, it goes by fairly quickly. Also, I started feeling sore an hour after the workout! How is that even possible? Today is day 3. I have no idea what is in store for me, but I will be pressing play regardless. Once I decide I'm going to do something, there is no backing out for me. I'm hoping my "after" pictures in June will show a leaner, meaner me and I'm looking forward to going shopping for a dress that will show off my hard work!